The Christmas season in Ireland is a happy combination of modern and ancient customs that combine to bring a unique meaning to this special time of year. While Christmas shopping, decorated trees, and Santa Claus are evident everywhere, traditional customs that signify the true meaning of this holy season still remain in small towns and villages where some people still celebrate the holy feast as their ancestors had for generations. On Christmas Eve, the windows are decorated with garlands of holly and ivy with candles centered in each — often in a hollowed-out turnip for support. The Christmas Wreath we know today is a reminder of that Irish tradition which began back in 16th century, when Penal Laws outlawed the Catholic religion and clergy. The Irish, intent on keeping their faith, secretly met outlawed priests to celebrate Mass in the woods and mountains whenever they could. Mass might be only celebrated rarely, but one time they never missed was Christmas. An alien power may control the land, but they couldn’t control the hearts of the Irish; they still had their customs and their faith and, by God, they would have their Mass! In post-penal years, as evening fell over the Irish hills on Christmas Eve, candles in each window were lit casting a magical glow over the hillside like scattered jewels on Erin’s cloak of evening, the largest of which were the churches dotting the landscape and beckoning the faithful to Midnight Mass. After Mass the people returned home and retired for the night leaving their doors slightly ajar all night as a symbol of hospitality insuring that no wandering couple seeking shelter would be turned away as was Joseph and Mary on that first Christmas Eve. A cup, saucer and soda bread were left on the table for the wandering souls from Purgatory who might wish to come home for Christmas. On Christmas morning, the candles would be snuffed out, preferably by someone with the name of Mary. Later that day came the Christmas meal followed by the Christmas pudding. After dinner, the children would play games while the adults sat about the fire, reminiscing about Christmases past until it was time to cut the Christmas cake and toast the season. The reverent celebration of Christmas in Ireland did not conclude with the setting of the sun on Christmas day. The season would extend for a full twelve days and any feast that fell within that period was considered a part of the overall Christmas celebration. Saint Stephen’s Day, December 26, is one such feast. In early times, the children of Ireland would begin St. Stephen’s day with a hunt for a small wren which they would kill and place in a little box. Today, a box decorated with feathers simulates the victim satisfying bird-lovers as well as saving the boys the trouble of the hunt. These Wren Boys then set off carrying the `victim’ and a collection of musical instruments centering around the Bodhran (a one sided drum) which is beaten as they make their rounds from door to door, singing the traditional Wren Song and collecting pennies as a reward for their deed, and to `bury the wren’. The Wren Boys were practicing a ritual that was old in Western Europe before the Christian gospel was first preached in the hills of Galilee. Scholars suggest it is of Celtic origin and that, with the coming of Christianity, its meaning was Christianized. The ancient Druidic version is that the wren was condemned to persecution by his fellow birds because, he used trickery to oust the eagle from the kingship of all birds; the story was used as a lesson to children about the virtues of honesty. The Christian version related that the wren flew from a bush betraying the hiding place of St. Stephen who was captured and martyred as a result, which explains the custom falling on St. Stephen’s day, and why it is the duty of all good men to hunt and kill the little beast. The tale associated with St. Stephen adds one more measure of religious significance to the season which continues until Little Christmas on January 6, when the visit of the Magi is celebrated. Years ago in some areas of Ireland, as in some parts of Europe, it was this day, rather than Christmas, when gifts were given in remembrance of the gifts of the Magi. Christmas is celebrated in various ways in various countries but nowhere is it more beautiful or meaningful than on God’s emerald Isle where the true meaning of the season is not forgotten. May we all remember the true meaning of this holy season and accept the wishes from and to the AOH National Board to keep the traditions alive for now and throughout the remaining years. 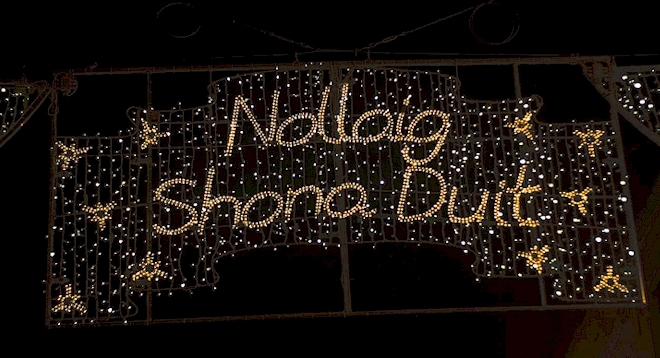 Nollaig shona dhuit, (nullig hona gwitch) — Happy Christmas to you.